Epirubicin is an anthracycline drug used for chemotherapy. It can be used in combination with other medications to treat breast cancer in patients who have had surgery to remove the tumor. It is marketed by Pfizer under the trade name Ellence in the US and Pharmorubicin or Epirubicin Ebewe elsewhere. Similarly to other anthracyclines, epirubicin acts by intercalating DNA strands. Intercalation results in complex formation which inhibits DNA and RNA synthesis. It also triggers DNA cleavage by topoisomerase II, resulting in mechanisms that lead to cell death. Binding to cell membranes and plasma proteins may be involved in the compound's cytotoxic effects. Epirubicin also generates free radicals that cause cell and DNA damage. Epirubicin is favoured over doxorubicin, the most popular anthracycline, in some chemotherapy regimens as it appears to cause fewer side-effects. Epirubicin has a different spatial orientation of the hydroxyl group at the 4' carbon of the sugar - it has the opposite chirality - which may account for its faster elimination and reduced toxicity. 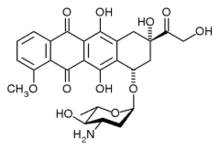 Epirubicin is primarily used against breast and ovarian cancer, gastric cancer, lung cancer and lymphomas. The first trial of epirubicin in humans was published in 1980. Upjohn applied for approval by the U.S. Food and Drug Administration (FDA) in node-positive breast cancer in 1984, but was turned down because of lack of data. It appears to have been licensed for use in Europe from around this time however. In 1999 Pharmacia (who had by then merged with Upjohn) received FDA approval for the use of epirubicin as a component of adjuvant therapy in node-positive patients. 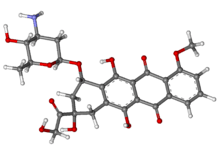 Patent protection for epirubicin expired in August 2007. ↑ Bonfante, V; Bonadonna, G; Villani, F; Martini, A (1980). "Preliminary clinical experience with 4-epidoxorubicin in advanced human neoplasia". Recent results in cancer research. 74: 192–9. PMID 6934564. PM6934564.